VTAC applications for mid-year 2019 will open this Monday 8 April at 9am. Current year 12 students studying on a standard VCE/Australian timetable should not create an account at this time. They will need to create a VTAC account from Monday 5 August instead to apply for 2020 courses. Current VCE and SACE year 12 students studying on a Northern Hemisphere Timetable and graduating in July can create an account to apply for mid-year courses through VTAC this year. Year 12 students from 2018 who wish to apply for mid-year courses can login with the VTAC ID and PIN obtained last year, re-use information from their previous application, and pay a reduced reactivation fee instead of the full processing fee. Any other applicants, including year 12 students from 2017 or earlier, can create a new VTAC account to apply for mid-year courses. The mid-year CourseSearch is now available online, listing the courses which are accepting applications through VTAC for mid-year entry. Note that not all courses accept mid-year applications, and some courses are not available through VTAC at mid-year. 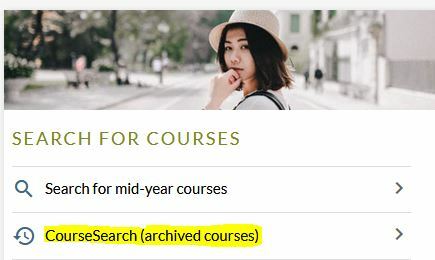 If working with current year 12 students, use the “CourseSearch (archived courses)” link to access the full list of 2019 courses. Course information for 2020 admissions will be published in late July.